I am a nature lover. Born and raised on a farm in Norway, countryside and wilderness has always been an important part of my life. Of all the environments in the world, the woods have always been closest to my heart. Although I spent most of my childhood in the forest, I never saw an owl. As birding became a passion, I really wanted to see them in their natural habitat. But, it took many years and another continent before I finally saw one. The very first owls I saw in the wild were in Saskatchewan, Canada, in November 2010. It was a Great-horned Owl, of the subspecies; Subarticus. The next one I saw was a Short-eared Owl. 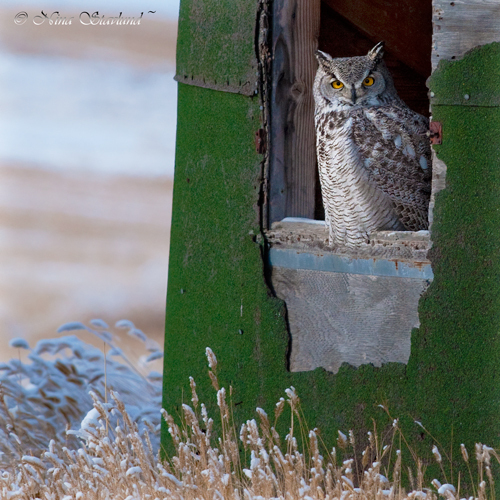 When I came back to Ottawa, Ontario, I participated in the Christmas Bird count where I was lucky enough to see yet another Great-horned Owl and a Barred Owl. My husband Tony and I went looking for owls many times after that, and we came across a Northern Hawk Owl on our search, but not much more. 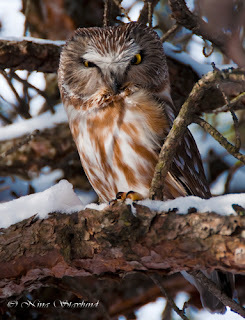 And then on a Tuesday morning, at the beginning of January, Tony found a Saw-what Owl in the forest of Gatineau Park, Quebec. The owl was not so easy to see, tucked away deep inside the branches. But, I instantly developed strong feelings for the species. Most people have a 'thing' for owls, and I am now one of them. What is it that makes us so fascinated by them? This will be the subject of a near future BLOG entry. We arrived on Amherst Island early Saturday morning and it started off with 3 Snowy Owls before we entered the owl woods. When we entered the woods we were all excited. Thanks to the directions from other observers we had no problem locating the owls. 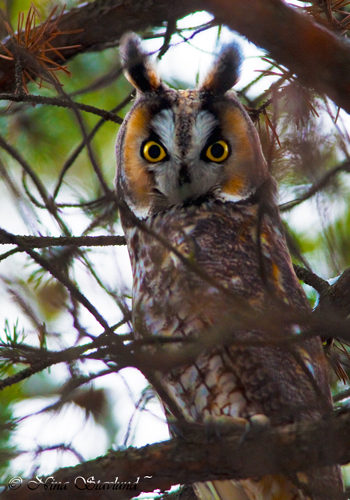 And shortly after entering the woods, the first of two Boreal Owl was sitting there looking at us, half asleep. We later saw 3 Saw-whet Owls. We also had about 10 Long-eared Owls. The second Saw-whet was an incredibly beautiful little predator. It was just sitting there looking around, wide awake. We could have reached out and touched it if we wanted to, but of course we didn't do that. To witness no fear from a little creature like that, melted my heart totally. Of course it helps with those huge clear eyes, that beams of wisdom and mystery. I now have a new favorite bird - the Northern Saw-whet Owl. 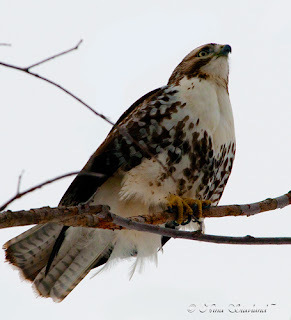 In addition to the fantastic experience of being so close to the owls, the abundant number of Rough-legged and Red-tailed hawks were amazing. They were literally everywhere, two and sometimes three of them flying and playing together up in the sky. We had a total of 57 species on this trip, and most of the birds were spotted on the island. Some of the highlights are: Harlequin Duck, Red-bellied Woodpecker, Northern Flicker, Red-wing Blackbird, Bald Eagle, Common Raven, Mute and Tundra Swan, Northern Harrier, Northern Shrike, American Kestrel, White-throated Sparrow and a beautiful male American Goldfinch in full breading plumage (extremely unusual for January). It was quite exhilarating to witness all this as some of these species were rare or unusual especially for January in southern Ontario. The weekend was unforgettable, and will be an important addition to me as a birder and photographer. For me, Amherst Island will always be a magical place, where many unexpected things are possible, and where a deeper connection with mother Earth is present in the many forms of her children. Seabirds used to be my number one favorite. This position is now in jeopardy with my new-found admiration with Owls, raptors and other predators. Amherst Island, is a most magical place. Unfortunately the tranquility has been dramatically altered for the many owls that overwinter there by us humans visiting the island. They have closed off a small portion to give the birds a possible sanctuary. What an exciting weekend!! 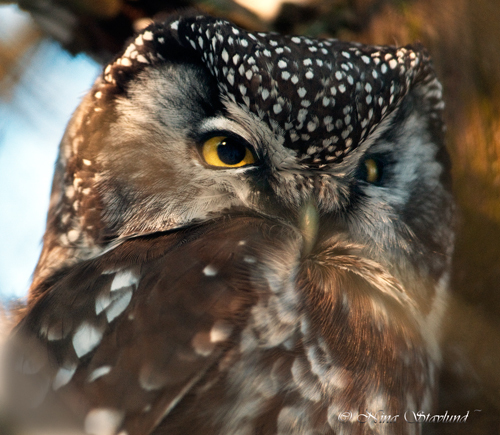 Love the photos of the owls :) Glad you had a great time! Nina...love your owl shots, your passion and your sensitivity. Seabirds, owls, raptors...I have learned to appreciate them all...each with their own unique beauty and place in the natural order. Wow Nina - lovely shots here. I always thought these birds are the hardest to see during the day. !